Forest Way Bunkhouse nestles in the stunning scenery of North West Highlands amid mountains and lochs and is just 9 miles south of Ullapool. This quality bunkhouse is the perfect base for walkers, climbers, cyclists and nature lovers. 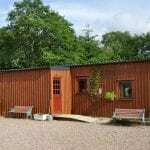 Forest Way is a real gem of a bunkhouse set in the majestic North West Highlands. Nestling amid mountains and lochs and on the iconic North Coast 500 touring route (NC500), it is the perfect base for mountaineers, munro baggers, cyclists, photographers and lovers of the great (Scottish) outdoors. Iain Kaye, your host is a keen hillwalker, cyclist, photographer and gardener. He will happily share his extensive knowledge of the local area with you. If desired there’s also the option of guided walks. Just 9 miles south of Ullapool, the gateway to the Outer Hebrides, Forest Way Bunkhouse is also a perfect stop over on your way to the Scottish Isles.